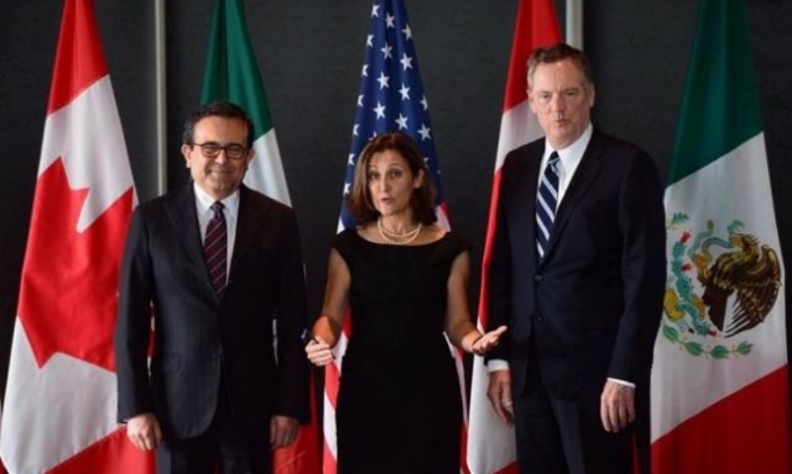 Mexico's Secretary of Economy Ildefonso Guajardo Villarreal, left, Canadian Foreign Affairs Minister Chrystia Freeland, centre, with U.S. Trade Representative Robert Lighthizer. WINDSOR, Ont. — The renegotiation of the North American Free Trade Agreement cannot be rushed, Canadian automotive suppliers were told during a panel discussion in Windsor, Ont., on Wednesday. Rodrigo Contreras, the trade and investment commissioner of ProMexico, a federal agency of the Government of Mexico that promotes international trade and investment, and Rene Friesen of Mexico-based parts supplier IZA D&M, joined Volpe during a discussion moderated by Automotive News Canada Publisher Jason Stein. The panel met just days before the renegotiation of the North American Free Trade Agreement picks up again in Mexico on Feb. 25. The United States has proposed raising the minimum amount of automotive content sourced from within NAFTA countries to 85 per cent, up from the current 62.5 per cent. The United States also wants a 50 per cent American-made requirement, which the auto industry and Canadian trade representatives have viewed as untenable. “I didn’t think that was a serious proposal,” he said. Canada has countered by suggesting more credit be given for driverless and electric cars when calculating regional content. It also suggested counting research and development work as regional content. Under Canada’s suggestion new automotive technology in electrification and autonomy would get more “points” toward regional content. Automakers would invest “where they sell” — which is to say the United States and Canada, Volpe said. “We only have one more round scheduled after that,” he said. Volpe said a “win-win-win is practically impossible” under a new deal, but “new balance” is possible. All three panelists encouraged the audience of parts makers and tool-and-die executives to call politicians in all three countries and drive home how important NAFTA is. “It’s in everyone’s best interest to work together,” Friesen said.